TRITON-TX8X is a tiny 68mm x 31mm SODIMM system-on-module based on NXP’s iMX8 processors, which are in turn part of the pin-compatible TRITON-TX i.MX6 / i.MX8 module family. The TRITON-TX8X is based on NXP’s i.MX8X QuadXPlus (DualX and DualXPlus will follow later in 2019) featuring 4-core 64-bit ARM Cortex-A35 cores running at up to 1.2GHz. The TRITON-TX8X comes with 1GB DDR3L 32-bit, and a 4GB eMMC. A second core complex features an ARM Cortex-M4F microcontroller, and comprehensive multimedia capabilities are provided by the Vivante GC7000 series GPU including OpenGL ES 3.1 and Vulkan graphics, a hardware VPU with 4K decode and 1080p encode and Tensilica HiFi4 audio DSP processor. The module provides a wide range of connectivity including two Ethernet ports, two USB 2.0 ports (USB 3.0 also supported – see table), dual MIPI-DSI / LVDS display controller, two MIPI-CSI camera inputs, and many other interfaces. TRITON-TX8X comes with mainline Linux BSP, with QNX 7.0 support under development. The i.MX6 and i.MX8 based TRITON-TX family modules all take a single 3.3 to 5.5v supply and provide an up to 300mA 3.3V power output for use on the baseboard. The i.MX8X based TRITON-TX8X brings powerful multimedia performance to the embedded user, with low power operation, in a range of applications including medical devices, industrial products and building control. To purchase a development kit, with optional 5.7″ touch screen, simply follow the “Buy Online” link below. A comparison table of our i.MX6 and i.MX8 modules is available here. Download Datasheet For further downloadable documents including pinout click here. Guaranteed lifetime is a key reason to choose us – some TRITON products have already been shipping for over 10 years. Each member of the TRITON-TX module family is guaranteed to be available, in small or large quantities for at least 10 years from launch. This is a minimum, with expected lifetimes of 15 years where possible. Direct Insight brought the first system-on-module to market in 1999, and has a unique track-record in maintaining partnership with our customers for the long-term, supporting you throughout the product life-cycle. Because the TRITON-TX modules are manufactured in a high-quality small-batch production facility within the EU, there are never problems with manufacturing standards or with supply. If you order 100 modules and we don’t have them in stock, we will make them. Often, cheap modules are produced in large batches by volume-oriented contract manufacturers in the Far East, and once they are gone, they are gone. Our Linux BSPs are internally developed, taking advantage of (and contributing to) the latest mainline kernels, and are designed so that you can use them without further development or modification. One of the key advantages of the system-on-module approach is rapid time-to-market, and requires a reliable, production-ready BSP, and a ready-to-roll compatible tools setup. For Linux, we supply a pre-configured VM SDK. Further to our 10-year longevity guarantee, additional security is provided by the pin-compatible nature of the TRITON-TX range, which means that suitable baseboard designs can take all the modules from this family, including those based on i.MX25, i.MX27, i.MX28, TI AM3354, i.MX51, i.MX53, Snapdragon 410E, i.MX6 and i.MX8, and allows older modules to be replaced by the latest designs, with new features, better price-performance, and renewed longevity. Striving for the best technical support provision to our customers is what makes Direct Insight stand out. Using a system-on-module is all about achieving a quicker, smoother route to project completion. We have supported our customers in many hundreds of system-on-module projects over the last 19 years, and are uniquely placed to assist you. i.MX6 and i.MX8 processors have a sophisticat ed feature called High Assurance Boot (HAB) which potentially allows the user to secure the device against code modification, while preserving the ability to update. This is achieved by programming public keys into the device, against which the private-key signed image and data are validated. 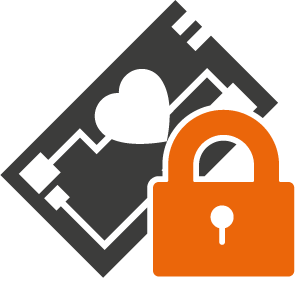 We offer HAB programming during manufacture to enable customers to easily secure their device. 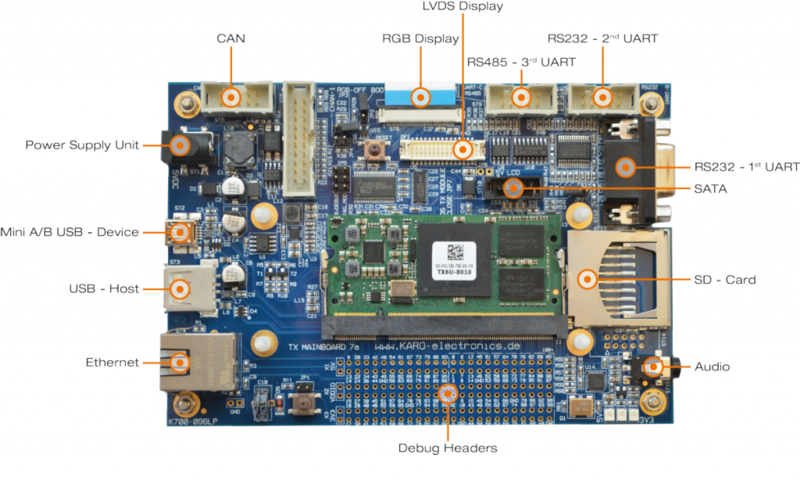 Main board-7 provides a complete development environment based on TRITON-TX8X, running mainline Linux out-of-the-box. The development system consists of a baseboard which provides an unpopulated bank of 0.1″ headers for all 200 module pins (including PCIe), plus connectors for all the main module interfaces, and includes additional peripherals such as an SGTL5000 audio codec. Other connectors include USB, Ethernet, SDCard, CAN, RS-232 and RS-485. The Mainboard-7 offers an optional 640×480 capacitive touch screen, and an LVDS output to enable connection of other screen sizes. For production purposes, you will require a custom baseboard, and we are happy to offer baseboard design and manufacture as a service. The TRITON-TX8X is not yet a released product. We expect to begin development kit shipments in Q1 2019. You will be able to pre-order development systems from late Q4/18 via our online shop, using the “Buy Online” link to the right. We look forward to providing you with knowledgeable, professional support to create your product. If you have questions, please don’t hesitate to contact us by calling Direct Insight on +44 1295 768800 9am to 5.30pm UK time, emailing info at directinsight.co.uk, or by using the “Contact Us” form below. Contact our experienced team with your detailed questions – we’ll be happy to help. You can quickly access volume pricing information using the “Get Quote” link to the right. Apps. Notes / User Docs.